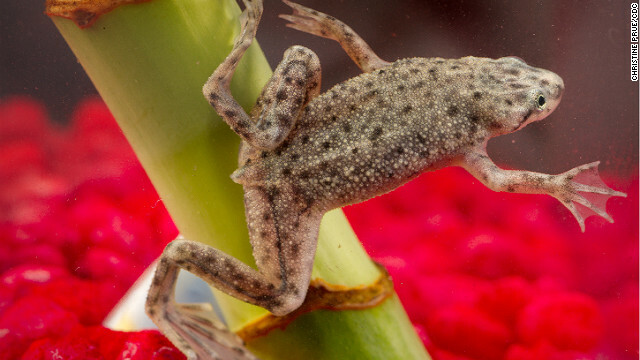 Investigators traced the salmonella outbreak to contact with African dwarf frogs. Raw meat is a notorious Salmonella carrier. It can also be found on unclean kitchen counters. An investigation published this week in the journal of Pediatrics suggests we should also look for the deadly bacteria in pet frogs. Investigators from public health agencies across the United States found that African dwarf frogs are causing a nationwide outbreak of a specific Salmonella strain in children. A group of health professionals make up the Salmonella Typhimurium Outbreak Investigation Team, which is part of the Centers for Disease Control and Prevention. Recently, the team has been examining the effects of African dwarf frogs on people’s health. “Amphibians and reptiles should never be kept in homes with children less than 5 years old or with people who have immune deficiencies,” said lead author and CDC public health advisor Shauna Mettee Zarecki. This includes day care settings and nursing homes, she said.